Superstar Rajnikanth is unique in global cinema. Nobody else bestrides popular cinema in quite the same way. In 2016 he teamed up with a young and controversial Tamil director, Pa. Rajinth. The result was Kabali (India, Tamil 2016). 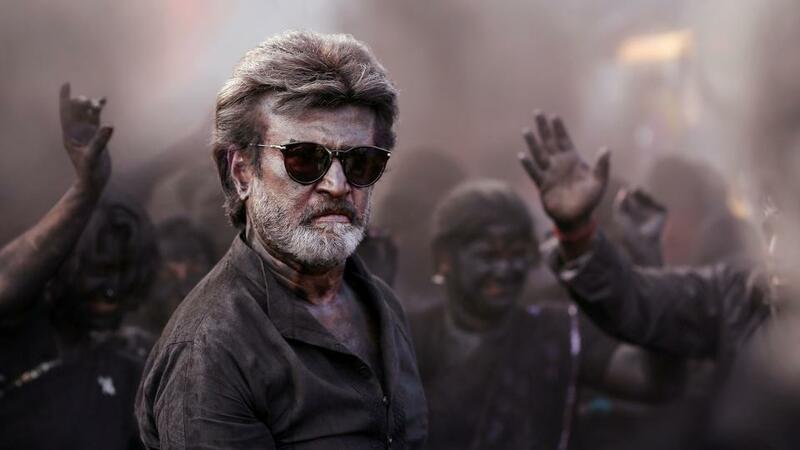 As usual, that film tended to divide audiences with the suggestion that it might not have appealed to Tamil Cinema’s masses who worship Rajnikanth as the ultimate hero. Personally, I enjoyed the film, but I can see what might be the problem. Rajinth, according to Wikipedia, was influenced as a student by films like Battle of Algiers (Algeria-Italy 1966) and City of God (Brazil 2002) and his second feature, Madras (India, Tamil 2014), was a political drama based in North Chennai. Clearly, in Kabali, the politics were not foregrounded enough – and Rajnikanth played too complex a character for his fans. Kaala doesn’t suffer in the same way on either count. Kaala takes on a host of political issues in contemporary India and I’m surprised that it has only, so far, been banned in one major market in Karnataka. It’s worth noting here that Rajnikanth has decided to do what his famous predecessors have done and move into politics. The attempted ban in Karnataka followed a statement Rajnikanth made about the decades long dispute about water from the Kaveri River which runs from Karnataka through Tamil Nadu (and Kerala). Or perhaps my surprise as an outsider perspective is not shared by many Indians? ‘Kaala’ or ‘black’ is the nickname of the Rajnikanth character. He is the leader of the Tamil clan in Dharavi, the biggest (and most famous) slum in Mumbai. These are Tamils from Tirunelveli District in Southern Tamil Nadu who migrated to Mumbai. In reality, the Tamils have been an important part of Dharavi since the 1920s and Tamil films have been set in the community before, notably Mani Ratnam’s Nayakan (1987) and Bombay (1995). Kaala saw his father killed in Bombay and has fought to become the most powerful figure in Dharavi. As well as his close ties to his own Tamil community he has secured support from the whole area which includes migrants from different states. The local population is highly diverse with many dalits and a significant Muslim population, proportionately much bigger than in Maharashtra as a whole or the rest of India. Kaala was once a ‘rowdy’ but is now respected by all. At the start of the narrative his status is threatened by ‘Mumbai Pure’, a fascist-like organisation described as a ‘Nationalist’ political party (and waving orange flags like the BJP) which intends to take control of the slum, ‘clean it up’ (so it is ‘white and pure’) and redevelop the land. The film’s script draws on a long history of attempts to do this. Dharavi is now in the centre of Mumbai – highly desirable land that would command a high price for upper middle-class accommodation for those who currently face a long commute into the city. 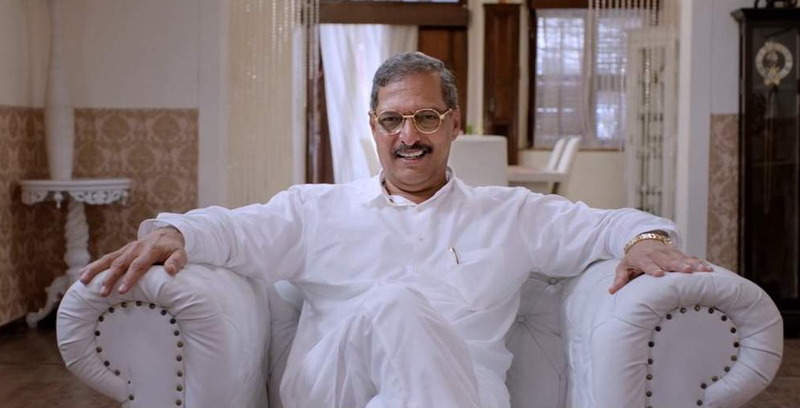 The plot sees a personal confrontation between Kaala and Haridev Abhayankar (Nana Patekar), the Mumbai Pure leader, who has local politicians and police in his pocket. The ‘personal’ dimension refers to events long ago between the two men’s families. It is further complicated by a split in Kaala’s own family with his youngest son ‘Lenin’ opting for a different approach to improving the lot of Dharavi’s slum dwellers. When a local stooge for Mumbai Pure tries to demolish a washing area with police connivance, Lenin and his partner are there leading a peaceful protest. But it requires Kaala and his supporters to stop the police and the bulldozers. Lenin then brings in a specialist NGO worker who turns out to be an old flame of Kaala. She is Zareena (Huma Qureshi) and she presents another potential problem, this time between Kalaa and his wife Selvi (Easwari Rao). Lenin and Zareena attempt to find a ‘third way’ between Kaala and Mumbai Pure which will lead to development that helps the residents of Dharavi. But who knows best? I enjoyed Kaala very much. Kabali had intrigued me because of its Malaysian setting. Kaala is, I think, a better ‘fit’ between Rajinth’s ambitions for a political film and Rajnikanth’s traditional role as hero for the masses. Reading some of the South Indian press reviews, I can see that there is a general feeling that the Rajinth-Rajnikanth pairing has this time got the balance right and in interesting ways. Rajnikanth is no longer the Superstar winning all the battles on his own. Instead he is ‘human’ – we first see him trying to cheat when he plays cricket with his grandchildren. His status is assured because he has helped his family members and others in the community to learn to fight for themselves – and he is prepared for them to argue with him, even if he still believes he has the right ideas. The community will triumph because his earlier actions have been revolutionary. At one point we even get the slogan ‘Educate, Agitate, Organise’. I was also pleased to see three strong and differentiated roles for women in this action film. Huma Qureshi is perhaps under-used but Zareena is an interesting character as an educated woman with international experience and status gained through her work. Easwari Rao as Selvi is particularly good and has made a strong impression on audiences as an ‘older woman’ who can be involved in a romance. Rajnikanth the star actor rather than ‘Superstar’ spends much of his time arguing with his wife – and expressing how much he loves her. Anjali Patil as Lenin’s partner Puyal Charumathi is also excellent. It was only later that I realised Anjali Patil was one of the leads in Newton (India 2017) and one of the other leads from that film, Pankaj Tripathi plays an easily corrupted police inspector in Kaala. There are many details in the dialogue, some of them seemingly playful ‘in jokes’ that collectively represent a certain kind of political text. Subtitles aren’t always the best way into the script but I noted a reference to Ilaiyaraaja, the legendary composer of Tamil film scores, including key Rajnikanth films. This links Rajnikanth to Tamil culture and its people (Rajnikanth was actually born in Karnataka). At another point someone jokingly refers to Kaala as being like ‘M.G.R’ – M. G. Ramachandran, the Tamil cinema superstar who became a leading politician and Chief Minister of Tamil Nadu from 1977 to 1987. This is in keeping with the film’s overall message – Kaala is a leader who will fight for the poor and the downtrodden. He makes the point forcefully that for the rich land is power (and money), but for the poor it is life. The central narrative is one that is crucial for all Indians. ‘Mumbai Pure’ is supposedly committed to helping the slum-dwellers, but in reality it will deliver wealth to the few. This is neatly symbolised when Abhayankar visits Kaala’s ‘castle’ and insults Selvi by refusing a glass of water. This is taken to be a refusal to drink from a vessel that might have been used by a lower caste person. Kaala is outraged and escalates the conflict but later he too will be humiliated when arrested. Kaala is a long film (160 minutes) and there is a lot going on. I’ll just discuss a couple of further points. First, the plot is structured so that we get various action scenes and two sustained sequences, one leading up to the Intermission and a second which is longer and climactic (so the structural conventions of the masala film are still in place). 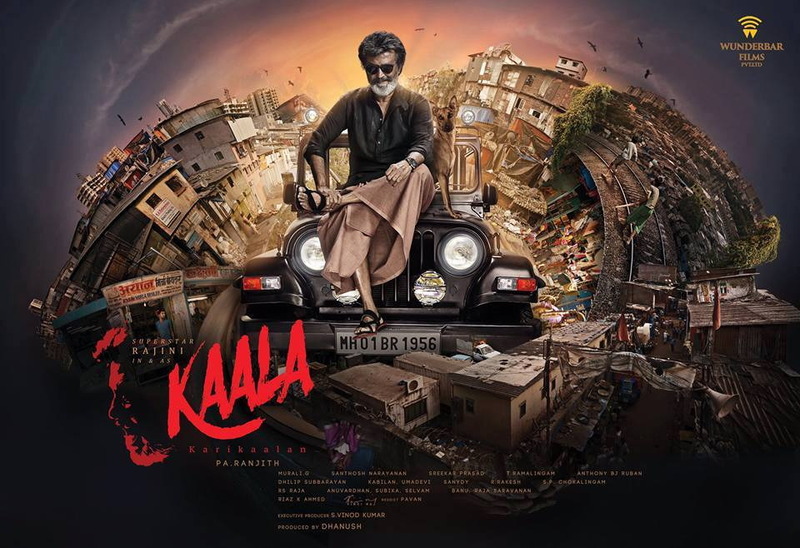 In the first, Kaala finds himself trapped alone in his jeep on a flyover during a torrential downpour and armed only with his umbrella – quite enough for him to despatch several goons who approach him. This bravura sequence (which reminded me of Tony Leung as Ip Man in Wong Kar-wai’s The Grandmaster (China 2013)) plays out to one of the several music tracks from Santhosh Narayanan. I’d like to show you the sequence but the best I can do is the soundtrack clip above which includes some still images of Rajnikanth in action in the rain. The film’s music is rock and rap-orientated. I was quite surprised by the rapping and by the Union Jacks on display. I’m completely out of touch with that music in the US/UK so I’m ‘twice removed’ in terms of Mumbai culture. Reviews suggest the score has been well-received. The second half of the film becomes an extended symbolic play on the traditional battle between Rama and Ravanaan. ‘Kaala’ is black as Ravanaan, ‘The Demon King’, and Abhayankar is white for ‘Pure Mumbai’, but the moral positions are reversed – white is bad and black is good. The final battle is indeed epic. The Dharavi slum seems to have been recreated in a Chennai studio and cinematographer G. Murali Vardhan who also photographed the previous two films by Pa. Rajinth has used overhead shots (drones? helicopter shots?) to suggest the exploding world of Darhavi within the wider Mumbai landscape. Rajnikanth deserves his superstar status. He is a fine actor and easily carries the film. I wonder how long he can continue at this level. Will the urge to go into politics divert him? Who knows, but we should support his films in the meantime. Pa. Rajinth is a director to watch. making a blockbuster film which organically incorporates fundamental political ideas is no mean feat. This will be in my list of the films of the year. One sobering thought about global film culture though – I was the only person in the audience in Bradford Cineworld (admittedly for a Sunday tea-time showing). The South Indian family behind me in the ticket queue were booking for Jurassic World.